The Professional Regulation Commission (PRC) officially released today, October 29, 2015 the complete list of passers for the October 2015 Electronics Engineer (ECE) and Electronics Technician (ECT) board exam. 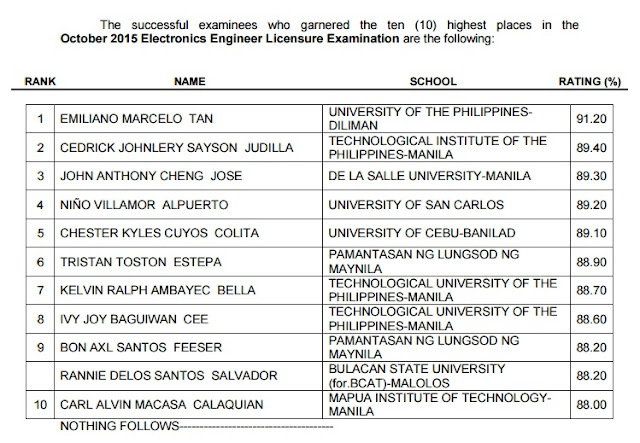 Emiliano Marcelo Tan from University of the Philippines Diliman (UPD) topped the ECE board exam with 91.20 percent grade. 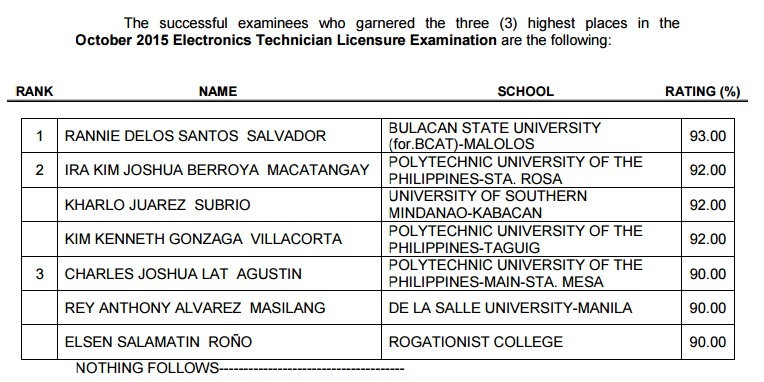 Technological Institute of the Philippines - Manila (TIP-M) and De La Salle University -Manila (DLSU) graduates ranked second and third respectively with 89.40 and 89.30 grades. Meanwhile, Rannie Delos Santos Salvador from Bulacan State University (BulSu) got the top spot for ECT licensure examination with 93.00 ratings.